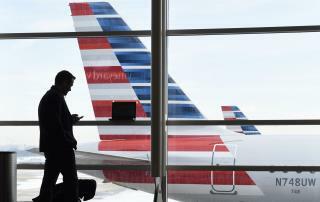 (Newser) – A 13-year-old girl traveling Wednesday as an unaccompanied minor from Dallas to Portland says she spent the first part of her flight "frightened and trapped" and the remainder of it too scared to even use the bathroom after a 26-year-old Oregon man seated next to her allegedly groped her, KOIN reports. Chad Cameron Camp was arrested by police and FBI agents after the American Airlines flight touched down in Portland Wednesday evening, CNN reports. Although Camp had reportedly been informed by flight attendants of other empty seats with more room, he chose to stay put in a middle seat right next to the teen. "I'm fine," he said, per the complaint seen by the Washington Post. And after he engaged the girl in a bit of conversation, she says she had to push herself up against the window to try to get away from physical contact including, per the complaint, Camp nudging and elbowing her, then placing his hand on her knee and inching it up her thigh. After asking the guy if he wanted to move and he said NO, they should have moved the girl!! When the flight attendant noticed what was happening, the man was immediately relocated. The girl never said a word. What more could the airline have done? If the girl wants money, get it from the perso who is responsible.